The combination of cacao and hazelnuts is a classic, and the hint of dates, prunes and raisins adds just the right amount of sweetness. This recipe makes use of a food dehydrator to maintain its raw state. The reasoning behind the low temperature is because it is believed that when food is heated above that level, nutrition is minimized, proteins are damaged, and phytonutrients are destroyed. Dehydrating also removes the water from foods and preserves its enzymes and nutrients. One of my favourite ways to use my dehydrator is making granola, and this is a basic recipe that I use that is open to endless combinations. Soak the buckwheat in the water for 45 minutes. Transfer the mixture to a fine sieve or colander lined with cheesecloth. Drain well. Rinse well, about 5 to 8 times, until the water is completely clear and the buckwheat no longer feels gelatinous. Set over a bowl and let sit 4 hours. Rinse a second time, ensuring the water runs clear. Let sit another 4 hours, then rinse well once more. 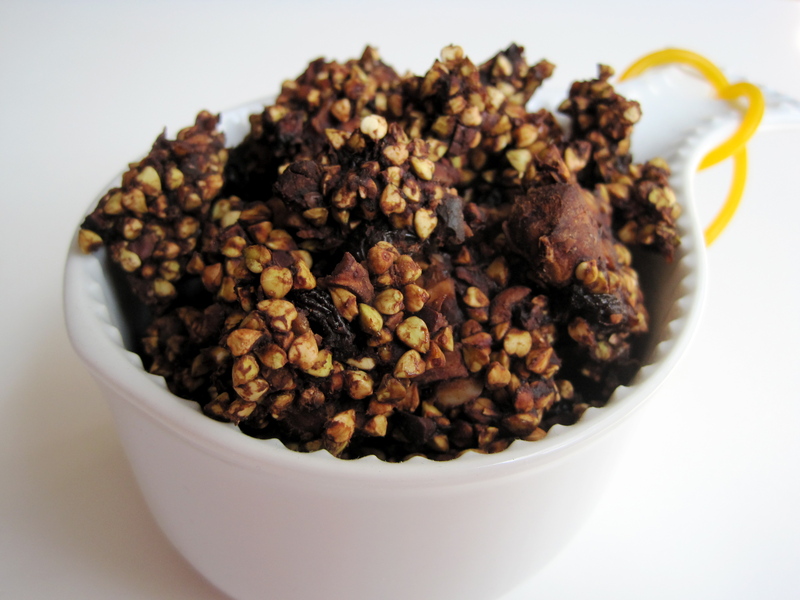 During the buckwheat preparation, soak the hazelnuts and raisins if you haven’t already done so. Put the water, dates, prunes, cacao powder, vanilla extract (if using), salt, and cinnamon in a food processor. Process until smooth. Scrape the mixture into a large bowl. Add the rinsed and drained buckwheat, hazelnuts, raisins, and cacao nibs. Mix well. Sample the mixture; though the flavors will become more prominent when dehydrated, you may want to add additional cinnamon or salt to taste. Spread the mixture in a single layer on dehydrator trays, using trays designed for small items or fruit leather. Dehydrate at 105 degrees F (40 degrees C) for about 8 hours until the top is dry and firm. Use your hands to break up the pieces and flip them over. Continue to dehydrate for 6 to 8 more hours, until dry and crunchy. Store in a sealed container at room temperature or in the refrigerator or freezer. I made this granola (with some variations – the fruit, mainly) last week and it’s been a great hit with the family. I personally love just snacking on the large clumps. I made a dessert using this granola and it was delish! I’ll be sharing it on my blog shortly. 🙂 Thanks again for the awesome recipes and tips! You’re welcome! I love the large clumps, too! Oh, this sounds veery yummy!